In response to the Strategic Plan for Climate Change and the proposed Action Plan for Climate Change, the U.S. 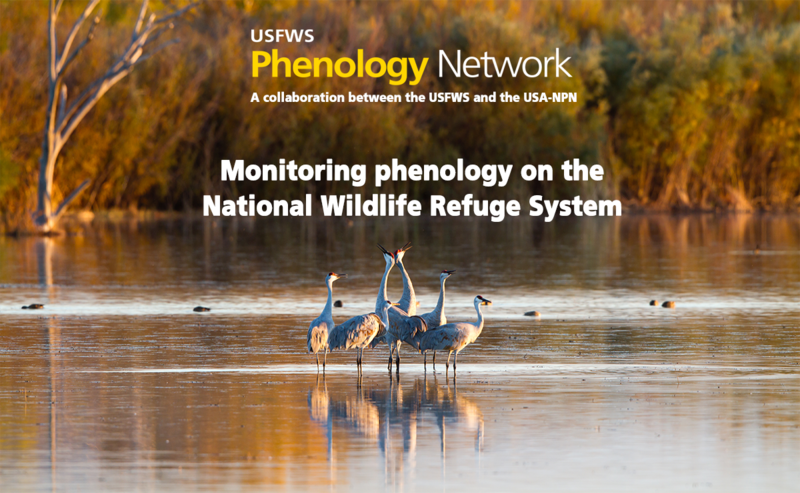 Fish and Wildlife Service (USFWS) National Wildlife Refuge System (NWRS) is collaborating with the USA National Phenology Network (USA-NPN) and its online phenology monitoring program, Nature’s Notebook, to monitor phenology throughout the Refuge System. The organizations share common goals of understanding and communicating patterns in the phenology of plants, animals, and landscapes, especially in response to climate change. This info sheet describes the partnership between the US Fish & Wildlife Service and the USA-NPN. The Inventory and Monitoring (I&M) Initiative supports Refuge Managers and Staff by providing standardized methods and protocols to inform management decisions and to facilitate implementation of on-the-ground actions. Learn more. Why is I&M embarking on Phenological Monitoring across the Refuge System? To collect and analyze phenological data to provide information on potential changes in key biological events (e.g. migration and breeding times) and the resulting impact on ecosystem dynamics (e.g., water availability, carbon cycling, and disturbances such as fire and insect emergence). To build awareness and public support for refuges and their monitoring activities through the activities of citizen scientists. To ensure that NWRS is a key contributor to a larger effort by providing data that will inform climate related management questions at local, landscape and regional scales. What benefits will refuges and managers see as a result of collaborating with the USA National Phenology Network? Refuges will have ready access to established protocols and a centralized data information system for phenological data. Refuges will have access to tools customized for easy input and output of phenological data. Refuges will have access to analysis and decision support tools to inform the timing of management actions and the overall implementation of adaptive refuge management.